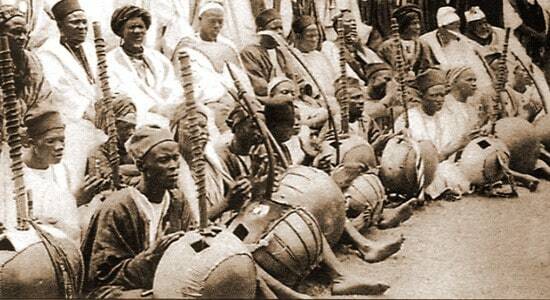 The ancient West African bardic craft known as Jaliyaa is a testament to the power of music and words. The wordsmiths of West Africa are popularly referred to as “Griots,” but in the West African language of Bamanakan or Mande Kan, they are known as Jali or Jeli (pl. Jeliw or Jalolu), depending on the region you travel into. A female griot is referred to as a Jelimuso or Jalimuso (muso meaning “woman). The craft of the griot, Jaliyaa, is traditionally, passed down from father to son and mother to daughter. In the 13th Century West African Empire of Mali, griots served the royal families as advisors, tutors and diplomats. Some griots also performed as court musicians, transmitting their knowledge through epic song/poetry and stories. As one of the few practitioners of Jaliyaa born outside of West Africa, Djeliba Baba the Storyteller is an anomaly. He translates the ancient tradition for contemporary audiences into an amazing confluence of song, music, and storytelling. Baba’s storytelling versatility is complimented by his accomplishment on one of West Africa’s most complex musical instruments, The Kora, a 21-string bridge harp, which has been played by griots for centuries. Baba not only entrances audiences with his beautiful speaking and singing voice but also accompanies many of his performances with a vast repertoire of both traditional and original music of the Kora. Baba’s multilingual fluency and immense knowledge of history and cultures has earned him a reputation as an unparalleled performer. If you have any questions, comments, or would like to secure Baba for a performance at your event, you may submit his Online Booking Form. Inquiries may also call toll free from anywhere in the U.S. to 1.866.525.4922. Thank you for visiting.